Large, fluted flowers, great scent and good plant vigour characterise this mixture containing all the popular colours. Scent Key - 2 (miedium scent) Height 180cm (6'). Easy to grow. HHA/HA - Half hardy annual/Hardy annual. Tall growing variety - supports will be required in the form of trellis, sticks, canes or wire netting. A stunning addition to any garden, sweet pea flowers demand to be picked - and with so many having such a sweet scent who could resist? Sow in pots or boxes in greenhouse/frame January-February and plant seedlings out in April after hardening them off. Alternatively sow April-May outdoors 1.5cm (½") deep and 7.5cm (3") apart. Transplant or thin out later to 23cm (9") apart. 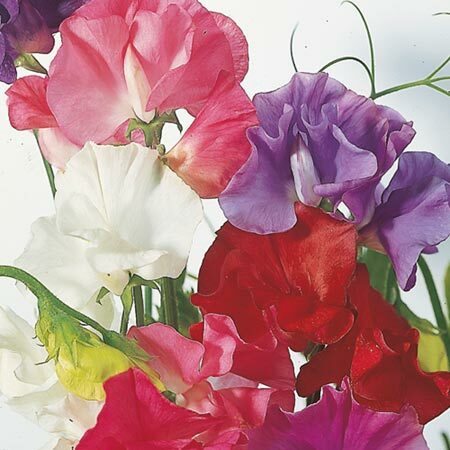 The finest sweet peas are obtained from sowings made in pots September-October. Young plants are wintered in a cold frame, and planted out 30cm (12") apart in March or April for flowers late May-August. Ideal climber. Scented. Attractive to bees. Suitable for cutting. Prefers full sun. Some varieties have hard black seeds and we advise soaking them in water for eight hours before sowing. Try growing gypsophila to complement your cut sweet peas. Pick sweet peas continuously to ensure a summer-long display.